Though the myth of bohemianism may exist, unquestioned, on the quirky Venice boardwalk, the Abbot Kinney Boulevard of today presents an enigma. Abbot Kinney, as I have come to know it, is a space of literal and figurative facades. Pretty buildings, praiseful reviews and well-dressed people create an aura of hype and “coolness,” and yet, the more time spent on Abbot Kinney, the more one senses an undercurrent of exclusivity and ostentation. 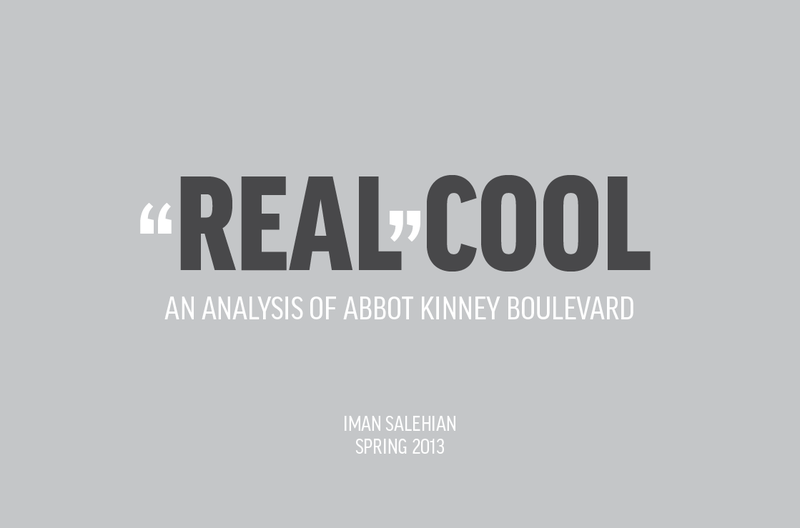 This project resolves to perform an internal critique of the perplexing “cool” culture of Venice’s Abbot Kinney Blvd. It accentuates the divide between lived experience (Prologue) and generalized reputation (The Reputation), and interrogates the uniqueness of its constructed spaces (The Built Environment) and inhabitants. In an attempt to execute my argument concerning “looks” vs. “reality” on a visual level, the visual design of this pseudo-guide book is done in the style of stores of Abbot Kinney’s branding (visible in the shop signage featured in the photos within the book), while my more skeptical personal commentary aims to disrupt the pretty “surface” of the report.